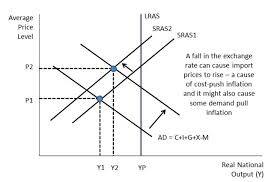 Foreign exchange rates are determined by supply and demand for currencies. Supply and demand, in turn, are influenced by factors in the economy, foreign trade, and the activities of international investors. Capital flows, given their size and mobility, are of great importance in determining exchange rates. If the country suffers from a balance of payment deficit, its currency will depreciate. If, on the other hand, a country experiences balance of payment surplus, its currency will appreciate. If the country suffers from high inflation rate, its currency will depreciate. On the other hand, if a country experiences a relatively low Inflation rate, its currency will appreciate. The currency, which gives a relatively high interest rate, will appreciate while the currency, which only offers a relatively low interest rate, will appreciate. “Hot Money” refers to money, which flows in for speculative purpose. When Hot Money Flows into a country, its currency will appreciate and vice versa. Hot money is a very substantial forces affecting the movement in exchange rate. Its flows into country interest rates are expected to rise, and especially when there is a speculation that the currency’s exchange rate will appreciate. On the other hand, when Hot money flows out, it will put pressure on the country’s currency, resulting in depreciation.